Welcome to Silverfish Press: home to the history and art of big-game fishing. While books on offshore angling are plentiful enough these days, most are of two sadly similar types: the "how-to" variety and the "went there, caught that" travelogue. Regrettably, the rich and fascinating culture of this great bluewater sport has been all but ignored. But not here. Silverfish Press is delighted to feature angler/author Mike Rivkin's groundbreaking books on this unique pastime. Its founding, hot spots, contests, and pioneers make for absolutely spellbinding yarns, and Rivkin does it all with his award-winning panache. 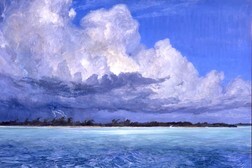 On the artistic side, we are delighted to reintroduce Stanley Meltzoff (1917-2006) to the world of premium quality sporting art. 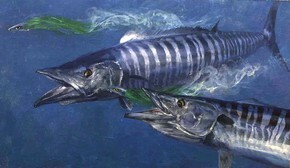 Meltzoff was the very first artist to paint big-game fish in their natural realm, and he remains the undisputed master of the genre. While a few others have had more commercial success, none have ever been able to equal his intricate compositions and astonishing realism... and not only in painting fish. In his day, Stanley's incredibly diverse work could be found in publications around the globe: from Field & Stream to National Geographic, Fortune to Sports Illustrated, Gray's Sporting Journal to Life. His 65 covers for Scientific American set a record that remains unchallenged to this day, and he was widely recognized in later life as one America's finest 20th century artists. Silverfish Press is honored to offer a wide variety of original art, books, giclees, and lithographs by this incredible artist. Take a look! You won't be disappointed. The indispensable guide to what's really down there! A sweeping look at the life and work of the greatest fish painter of all time. Co-authored by Stanley Meltzoff and Mike Rivkin. SORRY - SOLD OUT. Try www.abebooks.com or www.bookfinder.com. A lively and fascinating look at the history of big-game fishing and the organization that became its governing body. The fascinating story of big-game fishing's golden era, its sudden collision with WWII, and the unexpected ways each came to affect the other.